Veteran Scout sergeant who was instrumental for the Dark Angel victory on Piscina IV and who lost his life honourably in combat. Vet Sgt Naaman may also be used in games where the Dark Angel army of any size comprises of only Scouts and Ravenwing units fr the Trrop and fast Attack selections. A poor quality pict-capture of Veteran Sergeant Naaman prior to his deployment to Piscina IV during which he died a warriors death. 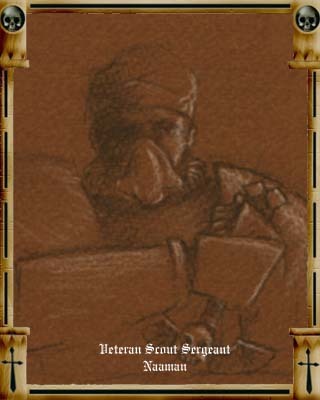 An extremely experienced Veteran of many campaigns, Naaman chose to remain with the Scout company rather than take the many opportunities to advance through the ranks of the battle companies and Deathwing. He was instrumental in providing vital intelligence that allowed Master Belial to deploy his outnumbered forces to effectively thwart the Ork invasion and plans for Piscina IV.